Despite the strong emphasis on public participation in the National Water Act (NWA), South Africa has yet to implement a comprehensive and functional approach to public engagement at the level of Water Management Areas. Part of the problem is that actual requirements are not explicitly articulated anywhere. This has led to the situation where public participatory processes are poorly conceptualised, misdirected and often perceived as confusing by stakeholders. 'Participation fatigue' is the consequence of this accompanied by a growing frustration with the implementation of the content of the Act. The intention for decentralised democratic water resources management is consequently seriously jeopardised if the public participation processes are not clearly presented in the public domain. In this paper we draw on a number of sources, namely a national pilot integrated catchment management programme called the Save the Sand Project initiated in the north-eastern part of SA, a Water Research Commission project on public participation and a DWAF project that funded the exploration of public participation in the Sand River Catchment. The latter (2005 -2007) supported a better understanding of public participation processes and dynamics in a high-density rural catchment, the findings from which are reported here. Additionally this paper is referenced against the current discourse on public participation in water resources aimed at elucidating public participation in integrated water resource management (IWRM) in South Africa. The focus of the work reported in this paper is specifically on the development and implementation of catchment management strategies as the locus of decentralised, democratised, participatory water resource management. In this paper we start out by discussing how complexities surrounding public engagement might present newly established catchment management agencies (CMAs) with serious challenges and then move on to a proposed framework for focusing public engagement on specific IWRM tasks. The framework outlines tasks where multi-stakeholder platforms collaboratively design strategic water management actions that are assembled as the catchment management strategy (CMS), a statutory obligation for CMAs. Integrated water resource management (IWRM) with its proposed institutional arrangements as set out in the National Water Act (NWA, 1998) provides the broad context for the engagement of the general public in water resource management. Once CMAs are established they are expected to manage water in collaboration with local stakeholders. 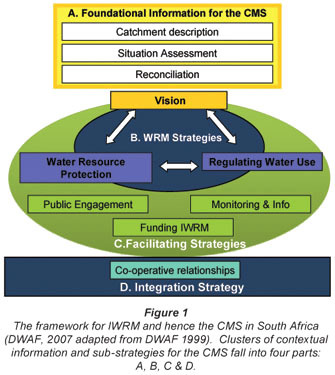 The NWA makes provision for a number of stakeholder platforms (catchment management forums  CMFs and catchment management committees  CMCs) where IWRM can be negotiated at the level of a water management area. A wealth of documentation, guidelines and research literature (DWAF, 2000; 2001a-d; 2004a,b; WRC, 2003; 2004a-c) deals with various aspects of the establishment and functioning of these platforms. The platforms are intended to be more than places where stakeholders defend vested interests in water resources. They are platforms where decisions are taken and collaborative actions are designed in order to strategically manage water resources for and by the inhabitants of a WMA. South Africa has yet to implement a comprehensive and functional approach to stakeholder engagement at the level of Water Management Areas. One of the most important challenges relates to focusing the interactions on specific IWRM tasks (Du Toit et al., 2005). As multiple stakeholder environments are potentially conflictual it is essential that tasks are clearly articulated and well presented at such forums in order to appropriately direct interactions. In this paper we draw on a number of sources, namely a national pilot integrated catchment management programme called the Save the Sand Project initiated in the north-eastern part of SA (Pollard et al., 1998; Pollard and Du Toit, 2004; Du Toit, 2005), a Water Research Commission project on public participation (Lotz-Sisitka and Burt, 2005; Du Toit et al, 2005), Catchment Management Strategy Guidelines (DWAF, 2007), and a DWAF project that funded the exploration of public participation in the Sand River Catchment. The latter (2005-2007) supported a better understanding of public participation processes and dynamics in a high-density rural catchment, the findings from which are reported here. Additionally this paper is referenced against the current discourse on public participation in water resources aimed at elucidating public participation in integrated water resource management (IWRM) in South Africa. The focus of the work reported in this paper is specifically on the development and implementation of Catchment Management Strategies as the locus of decentralised, democratised, participatory water resource management. Whilst we recognise the importance of an enabling legislative and policy environment, we maintain that these are not sufficient to support the development of meaningful public participation in IWRM. The National Water Policy (1997), NWA (1998), NWRS (2001), and the Guidelines for CMS (2007) explicitly outline the need for public engagement in IWRM. In a WRC report (Du Toit et al., 2005) the authors outlined a proposal for task-oriented public participation in IWRM. However it is only with the development of the CMS guidelines (DWAF, 2007) that a clear and practical guide as to how the public could be engaged in the various tasks associated with IWRM is presented. In this paper we take the issue further by proposing clear and specific public participatory actions for each step of IWRM as outlined by the CMS guideline. Additional steps in this regard need to include who is going to perform what action and when it should occur. Before we do this however, we provide the basis for motivating for a more focused and directed form of public participation in IWRM. Public participation in IWRM: What is likely to go wrong? Over the duration of the past 5 years the Association for Water and Rural Development (AWARD) and the Kat River Project, Rhodes University (see Burt et al., 2007) have engaged various stakeholders in participatory IWRM and capacity-development programmes. Based on these experiences we have extracted what are likely to be problem areas for IWRM processes in general in the hope that they can inform future public participation processes. An in-depth discussion of these is beyond the scope of this paper; however, the summary provided in Table 1 provides the point of departure for the development of a proposal that is outlined in the second part of the paper. (In the table we present three broad categories of challenges and we break these down into specific issues and their associated consequences). The obstacles outlined in Table 1 imply that IWRM requires substantial mediation and structure when taken into the public domain. We maintain that the three broad categories captured in the table are of such significance to the process of public participation that should they not be addressed the entire endeavour stands to be jeopardised. In the sections that follow we provide a proposed framework that could assist IWRM practitioners and CMAs resolve some of the issues related to the three problem areas outlined in the table. The CMA is faced with the huge challenge of having to design a process that facilitates appropriate engagement in IWRM, at the appropriate times. In this section we provide a framework that could assist CMAs in this regard. 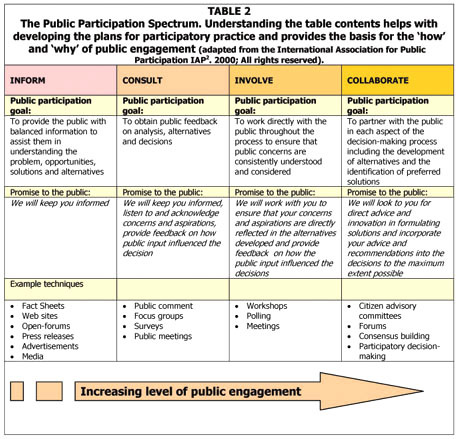 The International Association for Public Participation (IAP2) has identified different types of public participation (Table 2) which they call a spectrum. The IAP2 lists 'Empower' as an autonomous decision making process as part of the Participation Spectrum. However, this option does not exist within the South African legal context. The public is provided with the opportunity to participate in a collaborative manner but not to take autonomous decisions that the CMA must implement. The 'empower' column has been omitted. We see that the level of involvement increases towards the right of the table and there is a general trend from provision of information to collaborative decision-making. This does not imply that one is more important than the other. The challenge is to select the appropriate level of participation for a particular task. In this section we will identify the tasks and provide a framework for the 'right' type of participation to be supported by drawing on the public participation spectrum developed by the IAP2. Ensure greater sustainability of implementation by involving affected parties in a positive manner. In order to address these aims a framework for the development of a CMS is provided in Fig. 1 (DWAF, 2007). This framework is discussed in more detail by Pollard and Du Toit (2008) in more detail and should be read in conjunction with this contribution. For purposes of efficiency only aspects of the framework pertinent to the discussion of public participation will be described in this section. The framework is conceptualised as four clusters of strategic plans, Parts A-D, which collectively comprise the CMS. A number of these deal specifically with the 'business' of IWRM whilst others facilitate the operating of the CMA, roll-out and operation of the strategies. The parts of the CMS are described below. Part A does not involve strategy development per sé but provides the foundation for strategic action. It is important that the public has an important understanding of the contextual issues before engaging in strategic planning. Once a vision has been set for a WMA, two key strategic areas have been identified by the NWRS to achieve the vision. Importantly, these two areas, known as Resource Directed Measures (RDM) and Source Directed Controls (SDC), are the overarching strategies for IWRM in South Africa. The RDM is directed at protecting the water resource base whilst SDC constitute regulations for water use. The facilitating strategies are not directly linked to IWRM. Rather they are the 'oil' that keeps the 'engine' of IWRM going. In other words without strategic plans for stakeholder engagement and communication, information management and monitoring, and finances, the intentions of IWRM cannot be achieved. As is well recognised by now, IWRM requires collaboration. This is because many institutions are involved with various aspects of water-related activities, either directly or indirectly. Moreover, given our international agreements, the imperative for collaboration extends beyond our national borders. In this section we will demonstrate how each part of the CMS, and hence IWRM in South Africa, can be broken down into tasks with which the public can engage. Each task is divided into a number of steps (taken from the procedures diagrams in the CMS guideline, DWAF, 2007). Table 3 summarises the tasks associated with each part and indicates the types of participation most appropriate for each. Table 4 describes issues related to HOW each step can be conducted. Additionally, Table 3 identifies the different types of participation associated with each task. It is important to note that not every step associated with the task requires this particular level of participation. In the CMS guidelines (DWAF, 2006) a flow diagram is provided that indicates the appropriate level of participation at each stage of the process. In this paper we call for the development of participatory practices that are useful to the practitioner and that assist field staff with their facilitation. Table 3 does not describe aspects to WHO and WHEN for each step. This is the subject of an ongoing project. Further to this goal, we demonstrate in the next section how each task can be broken down into a series of steps that follow in a specific sequence. For example the situation description and assessment (Part A) is broken down into 8 steps each with a clearly specified purpose, level of public participation and an expected outcome. An example is outlined in Table 4 where 4 of the 8 steps are described. In this way practitioners responsible for facilitating public participation are able to guide the process and the public is provided with a clear plan of procedure and outcomes. Each section is taken directly from the CMS guideline and each task is developed in terms of steps (from the flow diagrams). The requisite level of public engagement is suggested and the 'how' for each task is reflected. The 10 sub-strategies for IWRM can be broken down into tables such as these in order to facilitate participatory practices. While this might seem an over-elaborate approach with excessive detail it has practical applicability in that it allows public participation facilitators to consciously plan in a logical and structured manner. The CMS guideline (DWAF, 2007) recognises that public engagement is an integral part of all components of the CMS. The guideline suggests that in order to formalise the public participation processes they should be collated into a sub-strategy for public engagement and capacity building. This integrative function is depicted in Fig. 2. Although this approach is open to the danger of over-structuring the public participation processes at an early stage it can provide a valuable mechanism for ensuring that public participation processes do in fact take place and that the public can hold water management institutions accountable, should adequate public engagement not take place. The need to deepen the discourse on public participation in IWRM is critical for the development of an appropriate, practicable and functional approach. And while we recognise that this paper cannot present such an approach in its entirety we believe that the contents provide a step forward in the direction of developing the practices of participatory IWRM. We close with a number of points for discussion. The framework presented in this paper aims to provide practitioners with a concrete expression of IWRM through identifying specific tasks and distinguishing specific steps with designated outcomes. The aim is not to be over-formulaic but to provide some norms and standards with which multi-stakeholder groups can engage. Practical steps are currently being developed as part of an additional project. Public participation in IWRM is not a single-step process. This paper calls for the disaggregation of public participation into various types of participation using the IAP2 Spectrum. 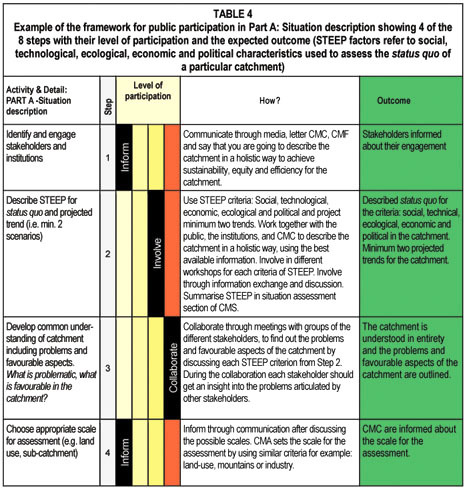 The levels of participation vary according to the specific stages of a water management task. The public is not expected to be participative in every step of the process. For example, the setting of the Reserve is a technical process that does not require public engagement. However, the public needs to be informed when a Reserve has been set so that an appropriate management class can be deliberated on. This demonstrates the 'integratedness' of all the IWRM tasks  the framework makes this explicit. Adopting a task and outcome-specific approach to IWRM provides an opportunity to better facilitate and manage the process. Using the framework for the development of the CMS means that the issues of sequence and procedure are clarified and that the public is in a better position to participate meaningfully. It is important to note that collaborative engagement is not expected in every instance and that it is reserved for specific steps in particular tasks. Collaborate engagement is costly and resource-intensive and not necessary for most steps in the CMS processes. It is important that stakeholders are aware of this so that the process can be focused and efficiently executed. The authors are greatly indebted to the various individuals in the Department of Water Affairs and Forestry and other institutions who supported this work. Financial assistance from DWAF is acknowledged.